As one of the first digital groups worldwide Station Rose have used the potential of audio visual media and the internet for performing in their work (1991). Station Rose´s audiovisual compositions consist of visual and acoustic patterns, the outputs of the visual- and soundworkstation get merged into a whole, LIVE in realtime. Pictures and sounds triggered by sequencers provide the basic loops over which Station Rose improvise during their live set. Sound: live-sequencing of the latest compositions by Gary Danner, which „put Techno in a sliding scale of forms and responses“ (The WIRE). Visuals: Elisa Rose combines animations, graphics, videos, as well as stills and text from the Digital Archive of Station Rose live into modular sequences. 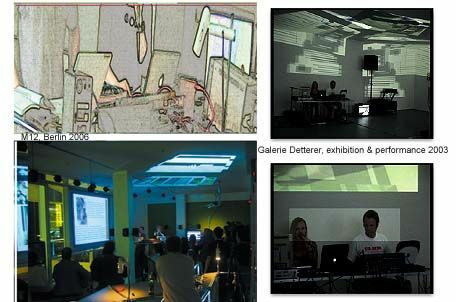 Station Rose creates a „virtual room inside a room“, consisting of light and sound through beamers, P.A. and projection screens, which embraces the audience. Station Rose performed at Ars Electronica, at the ICA in London, Cyberthon and Joypad in San Francisco, Cimatics in Brussels, Museum of Applied Arts and the Museumsquartier in Vienna, Transmediale in Berlin, Le Batofar in Paris and at Viper in Basel, as well as in every major technoclub in Germany.